South Ocean is not trying to pick bottoms or tops in the market. The strategy is to follow the money, which follows the market, which anticipates the economy. Historical turning points are valuable pieces of information. These “pivots”, as the turning points are called, indicate where “buyers” stop buying and “sellers” stop selling. Over time, the levels at which these pivots occur become important areas to consider in determining projected buy and sell levels. The range, or distance, between these pivot points is also useful in determining the distance of the next move. This investment style combines the attributes of a trend following strategy and a breakout strategy. Equities – normally long only, with a time frame of a few months. We can use the leveraged short ETF’s for general moves down in the market. Futures – Long and short indices, metals, bonds, currencies, some of the grains; normally for the week, sometimes just for the day. These futures also inform our views on the equities market. Trading is a business. If you go into any new business venture you need to develop a plan. This South Ocean site will try to help you in your planning. As the market and the economy are cyclical, so is the process of learning to trade. It is useful to know where you are on that cycle. Think of an ABCD pattern. This learning cycle starts at “A”, moving up to “B” with the books, seminars, internet searches, charting software; all parts of the “tuition” costs of learning. Along this A-B leg up, we experiment with some trading. We lose money; more “tuition”. 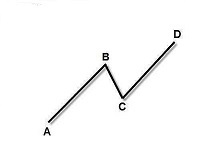 Then as we approach the “B” point, we catch a trending market and have some successes! But then trading profits take a turn down. We make mistakes. We fail to follow our method’s rules. This is the path to point “C”; and while along this path, doubt creeps in. We change the markets we trade. We search for a better method. Some may even give up. Then we reorganize and try again with rules that have served others well. We are now looking at the path to the “D” point! Still, perhaps knowing better, we adjust these rules; observing some and not others. But we do begin to see that it can work, we also begin to understand the cost of not observing the rules. By now, we are slightly ahead of the accumulated “tuition”. Finally, we believe and are able to master the rules and ourselves. But you must enter into this adventure understanding that you can’t know, or learn, it all in “one day”. This description of the learning cycle is a condensed version of a years long process. Trading is a constant learning process. You should assume everyone on the other side of the trade you are making is a professional with years of experience. The neutralizer we all have against those sophisticated competitors is that the market doesn’t care how much experience anyone has accumulated. If we can setup rules for ourselves to manage the day, then the risks that will come may not seem so daunting. Visit the Trade Setup page to see the plan in action. Get some good equipment. This is a visual style of trading. For charting, we use Tradestation, but most of its competitors are just fine. Tradingview.com is a free site with some basic charting tools that might help getting started. Ira Tunik tells me that the discount brokers are providing some good software as well. Know how much money you can put at risk. You will need some cushion for the inevitable trading losses.